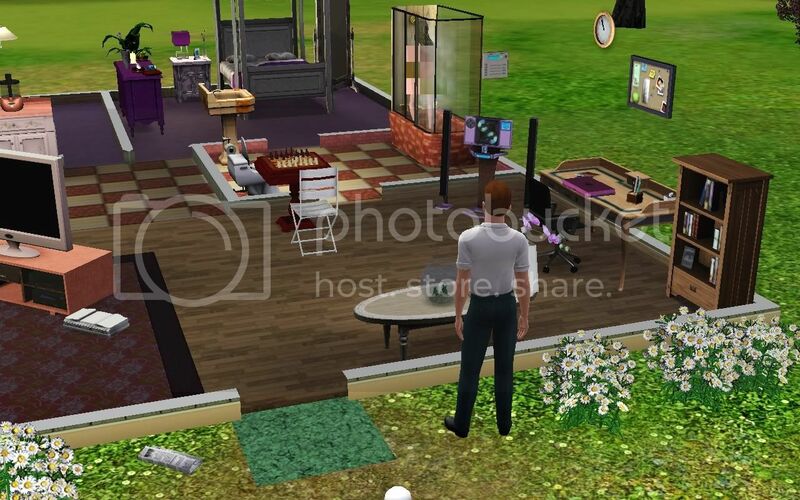 Mod The Sims - What's Happening In Your Game Right Now? General - What's Happening In Your Game Right Now? Replies: 3328 (Who? ), Viewed: 64535 times. #1 5th Jun 2009 at 7:07 AM Last edited by ani_ : 5th Jun 2009 at 7:24 AM. 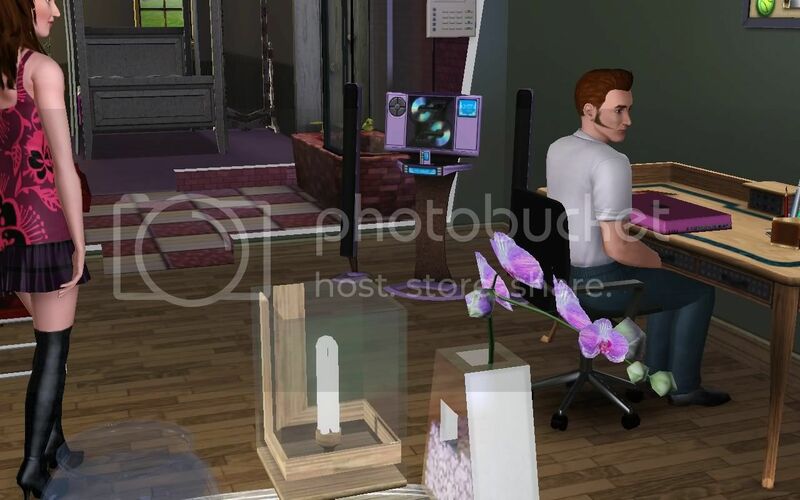 We have this thread for the sims 2, but not for the sims 3 so here it goes. Meet Heinrich Hurst . 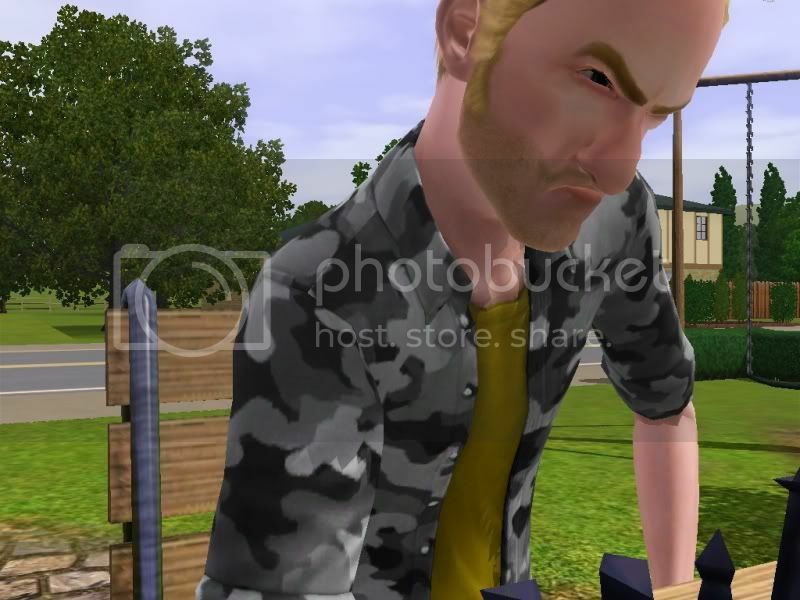 A grumpy, evil, brave, green thumb, handy sim who loves pop music (like wtf? ), autumn salad and the colour yellow, and his ltw is to grow 8 perfect plants. He doesn't have a job, he gets his living from selling vegs to the market, and trying to do some challenges as they show up, so far he got 300 from doing 3 different workout routines, each lasting 30 minutes. He's been working on his gardening, he tried fishing but got nothing. His gardening skill is now 5, he has a few unknown seeds grwoing, and a few in his inventory he cant grow yet. Becuase I'm fast with coming up with rules, I'v decided that once I promise something, I'm not allowed to remove it, so now he has two wishis I'm trying hard to fulfill but so far have failed, grow a great lettuce, and grow a perfect lettuce. So far the best quality he has grown is with the apples, something like high quality or what ever, but never perfect. One of his wishis was to steal candy from a kid, so what better place to take him into other than the playground. The only people who showed up were four middle aged men, who "innocently" spent the day reading on the park bench, or just staring into distance, perverts. Well, Heinrich is no perv, so I made him play chess, he got a challenge to win three chess tournaments, he won two, lost one and then was too tired to continue, the tournament expired pretty much after that, so he got no moneyz. When I left the house, Heinrich was on a coffeine rush fixing his broken sink, while the very easy Broke girl was sleeping in his bed as she accepted to stay over, they have not woohooed, as she went straight to sleep after having some salad. In my family, the mother is obsessed with gardening. The father is busy trying to become an Astronaut (and they have stopped spending time with each other...which is really damaging their relationship). The oldest daughter, which my husband and I affectionately call "Toad Baby" has just grown into a guitar-playing teen with dreams of becoming a composer of movie soundtracks...and the younger daughter is almost to the end of toddlerhood, but hasn't learned to walk yet. I based a sim on me, and another sim on a uh...person I know. I had them meet near the beginning of the game (two days ago) and now they're in a relationship, living together. My plan is that he gets her pregnant "by accident" (I put that in quotes because it doesn't REALLY happen by accident...you probably get it, the "woohoo" and the other option) and then whatever. I made characters of both myself and my partner in the game. So far in the game, we have 1 daughter who is a toddler and I'm pregnant again. My partner phoned the repair "lady", who at first was a guy, but second time around a lady and asked her to fix the toilet, whilst I was asleep, he started flirting with the repair lady and making moves on her, she accepted at first with her quiet giggling, but as soon as I awoke, walked into the bathroom and saw what was going on, I poked her and she declined further flirting and left the house. My partner then walked away and I went back to bed. The toddler is well behaved, has just started to go to the potty by herself and is walking, but not up to scratch with talking... nearly though. I'm about to redecorate a new home. I got my game yesterday and my first character is a young adult named Eve Moore. I was basically using her to explore the town, and all the new gameplay. Well, she was down in the park, when out of the corner of my eye I noticed a mysterious man in a leather jacket staring at her. I walked her over to him and did her ''Special: Charming Introduction', and he seemed immediately hooked. He introduced himself as Stiles McGraw, and in the course of getting to know him, Eve discovered he was a Music Scout, and that he was also rich! "She's got the gold star here!" I thought to myself. 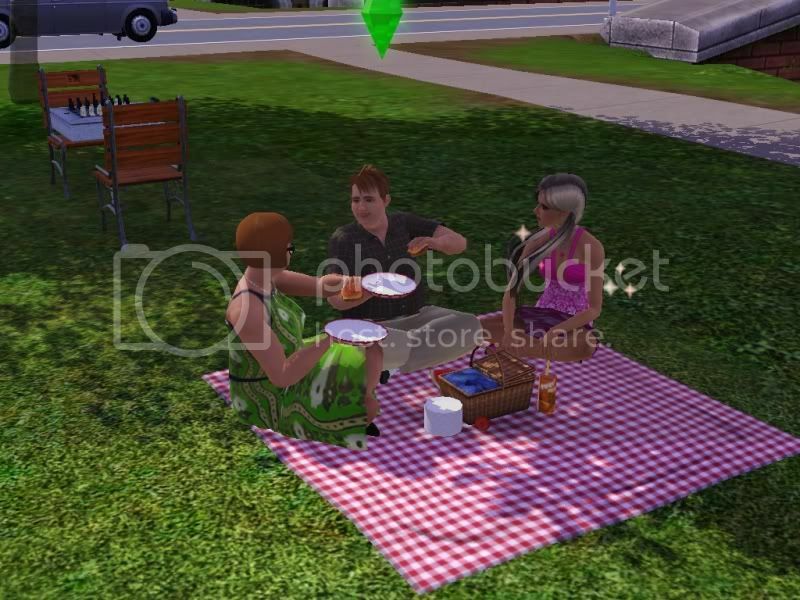 Anyway, a few dates ensued, and things were going so well that Eve asked Stiles to move in with her. He readily agreed. Eve had already discovered Stiles was a light sleeper, but his constant tossing and turning during the night must have bothered her a lot. I noticed the 'Stop Doing That' option popped up a lot. A few days later, Eve was elated to discover she was pregnant! Stiles was over the moon and constantly asked me if he could listen to Eve's tummy. It was during this time that Eve and I discovered that Stiles is also 'Neat'. Let me tell you, it's a good job he makes ok money because there needs to be something that makes up for the huge amount of MOANING he does about every single thing in the house. He has to clean everything until it's pristine, the trash compactor has to be constantly empty, no plate can be left ANYWHERE. Anyway, during Eve's pregnancy, I tested the '3 pieces of watermelon if you want a girl' thing, and I'm happy to say it worked. Their daughter Kitty was born in the hospital last night. I'm loving this game, it's everything I imagined and much more. p.s. When Eve went into labour, she rushed out for a taxi and I assumed Stiles was following her. When I realised he wasn't, I clicked on him to check what he was up to. What did I see? 'Put Away Leftovers'. Followed by 'Clean Up'. LOL!!!!! I love that guy!!! Soleil Adams is a young adult who hit the "motherlode" when her grandmother left her 150,000 simoleons. She's beautiful (as beautiful as beautiful gets in TS3), creative and longs to be a world class chef. Soleil came to Sunset Valley to put some distance between her and her overbearing wealthy parents in Veronaville, who could not accept the life of a lowly cook for their private school educated daughter. 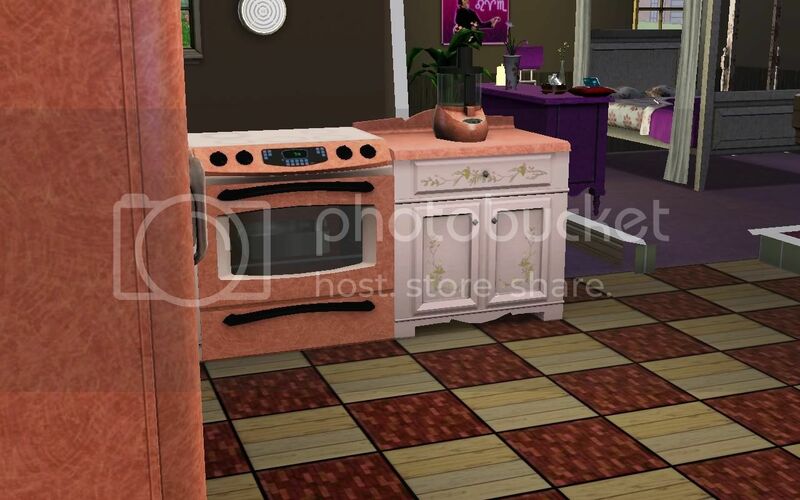 Soleil bought a cute two bedroom one bath place and fitted it out with expensive furniture, fixtures, art and appliances, hired a maid and launched herself at the task of becoming the best cook in Simland. The problem? Soleil has never had to work before. Rich and pretty doesn't account for much in the kitchen and she lasted two exhausted days as a scullion at the local bistro before quitting. She soon took both writing, fishing and gardening classes and is attempting to make a living selling fish and produce and publishing her work. Her first novel, a science fiction train wreck, barely earned anything. She makes just enough from fishing and gardening to buy recipe books and cookbooks and keep herself fed. None of these challenges have dimmed Soleil's determination to master cooking or, apparently, her taste for a lavish lifestyle. Her regular bills run nearly into the thousands and Soleil blows Simoleons on movies, the symphony, concerts, sporting events and dining out almost every day. With her funds running low, Soleil seems unaware that she won't hit the "motherlode" again. Will she buckle down and get a regular job, cut down on her spending and downsize her living arrangments? Or will she spend every last Simoloeon and end up running back to Mommy and Daddy in humiliation? Henri and Elaine Rousseau are a young adult couple who came to Sunset Valley where the property is cheap and the opportunities are many. They are both family-oriented kind hearted Sims who long to raise a large brood in a quiet Sim suburb. They weren't in town a day when they started hearing the distant sounds of a lullaby letting them know that their first little blessing was on the way. Money is tough to come by, but these two are hard workers and careful spenders who jokingly call their style "budget minimalist". They are saving money in the hopes of expanding their tiny home to accommodate the many children they plan to have. Henri works in law enforcement but Elaine became pregnant before she could find a job and both decided she should be a stay at home mom. Will their love and determination be enough to give their family everything they need or will Henri struggle to find the time to climb the professional ladder? It's a balancing act, but if anyone can do it it's this loving couple. Ivana Montpelar is an angling Hawaiian girl making a living off the fish in the sea. (Well, river.) She's currently very lonely as I never see other sims around, and working her way up the cooking and fishing ladder. She's got a green thumb, but has yet to plant anything, as she's only just got settled in her part of the town. She's an avid bookworm, loves getting books from the store, and using them to further her cooking and fishing career. I'm playing the Goth household and they have some serious marital problems. 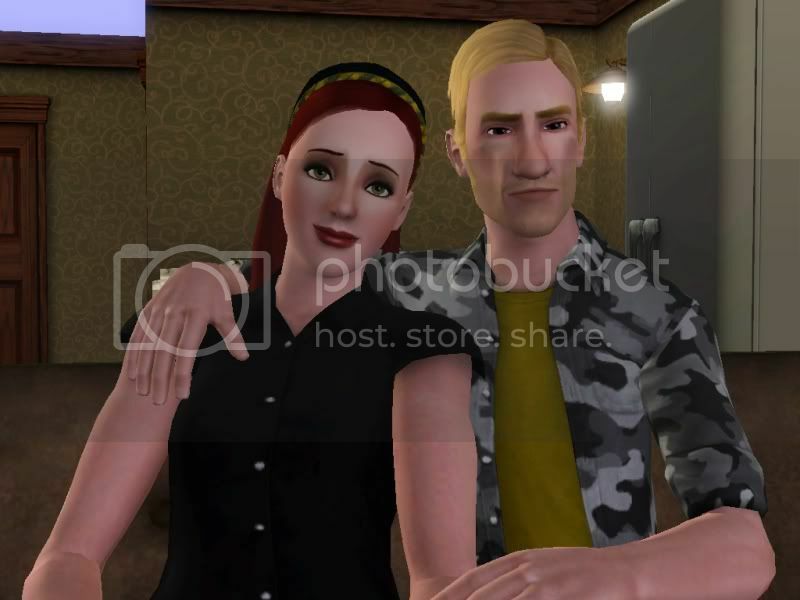 Relationships are much more difficult in Sims3! Both of them can be mean and did not spare it on each other. I was focused on Mortimer when I caught his mother and father going at each other. They had options like insult for being workacholic or insult for being unromantic. This was after me working with them for two sim days to get their relationship high enough to try for a baby. I made a Sim named Thalie Moore and one of her traits is insane. Funny lol She wears some outfits at the wrong time and talks to herself. She's in the sports career. She has light blonde hair with pink streaks. My sim, Peter Browne, just got promoted to "cutpurse" in the crime career. He also has a stake in the crime business at the Warehouse. He woohooed the maild, Kate Pistachio and is best friends with his boss (forget her name, starts with an A). He got arrested recently (I've written about this, it was pretty cool). Chloe Bloom is an aspiring symphonic composer. She works in the orchestra at the local theater and is a very accomplished guitar player. (You can often find her in the local park performing a wide variety of musical compositions for tips.) She rides her bike around town to visit friends and was attacked by an enraged zombie bear during one of her outings while exploring the catcombs at the graveyard. While she is gregarious and friendly, she has fallen in love with a loner from the Roomies household. People think they are just too different from each other, but they disagree. They had a lovely wedding on the beach with all their family and friends (of course, she biked to it in her wedding gown! ), have moved into the Monotone house, and have begun their life as newlyweds. They are now deciding whether Chloe will continue on her successful career path or take a break to have a family. They are going to let me know once they make up their minds. There was a funny case where it seemed like he was spying on her showering. I haven't gotten attached to my sim so I still don't have a name for her (her name is loloolol lololol or something)..my sims 2 family had elf ears and this male maid's last name is Elfman so I really want him to marry my sim. Desmond and Mitzy McAllistair are both very Charismatic and ambitious Sims. Both like to dress with class and stay fit. Desmond was perfect for politics with the shop hair that looked like both the guy that shot Milk and the guy who tried to sell Obama's senate seat (Ah, politics). Mitzy just looked like a reporter from times past with her classy glasses and rather retro hair. Both advanced quickly in their chosen fields. However Desmond knew that if he was going to go places in his field, he'd need a beautiful wife and family to parade around with him as he campaigned. Fortunately for him Mneme Gregory, who I can best be described as an African goddess, moved in across the street with her Orion (Green skin ftw) roommate and some trashy blond girl. He knew Mneme would make the perfect wife. They hit it off fast. Unfortunately, at one of Desmond's campaign fund raisers, she wouldn't quit eating and gained a ton of weight, however, I convinced her to move in got her trim. Finally, she asked him to marry her (for some reason I couldn't get him to do it) and soon they got married on the beach at sunset, because they both look really good in swimsuits. He somehow got her last name, ending up as Desmond Gregory. They conceived their first child that night, since Mneme wants a big family. So far they have one son, Othello, and another on the way. Mneme has the fertility reward, so I'm hoping for twins. Mitzy so far has done well in her career and become a successful author on the side. She's been so busy with work that she just began her first relationship with Conner Frio. However, I can't imagine her ever having kids of her own. She'll probably help around with her nieces and nephews though. I have completely forgotten to take any pictures and I really should have because there were some great scenes! But here's what's going on with my Sim, Seth Tamarack. Seth needed a change of pace and a change of scenery. Little did he know what he'd find when he decided to move to Riverview. The ads he had read, after all, made Riverview sound like a lovely place to live! Apparently Seth had really read a fairly old newspaper, though, because when he arrived in Riverview, he found a ghost town. Aside from the fish, there was not a single living being there! Seth still has no idea what actually happened to the original inhabitants of Riverview but he was able to determine that whatever it was only hurt the humans and nothing else. With no people in town, it was obvious Seth was going to have to rely on his wits to make a living. After all, you can't get a job in a store that will have no customers, or work at companies with nowhere to ship their goods. Oddly enough, though, a newspaper was delivered to Seth's front door every morning and for some weird reason mail deliveries were still running (must be coming in from another town or some such). The idea of services coming from other towns proved correct when one evening Seth caught his stove on fire and it took nearly two hours for the fire department to arrive. By the time they got there, Seth's stove was ruined and worthless. The 130 simoleans his insurance company gave him only covered about a third of its replacement cost. For days on end Seth scoured the town making a living by picking fruits and vegetables from the many abandoned gardens. He was finally able to start growing some of his own fruit and started catching enough fish to use for fertilizer. He also used some of the vegetables he picked around town for bait to catch more fish. He also picked up a lot of random seeds from around town and once a few people started moving into Riverview was able to start selling some of those (he had way more than he could plant) to the grocery store. Seth has managed to meet a few of Riverview's new inhabitants but is usually way too busy to do a lot of socializing. His closest neighbors live next door so he visits them occasionally. So far everyone who has moved in are young couples with babies or toddlers. Just like after any disaster, looters were running amok. One night one of them broke into Seth's house and took his toilet, of all things! Seth made an emergency call and even though the police, again apparently from another town, weren't able to arrive in time to catch the burglar, he was at least able to file a report. The officer who arrived was a woman by the name of Kizzie Mayberry. It took quite a while for Seth to give her all of the information, so by the time she left they had hit it off pretty well. A couple of days later, Seth invited Kizzie over for dinner. They seem to have a lot in common and love talking to each other, and once in a while Seth hints at some romantic interest in Kizzie and hasn't scared her off yet. Kadien- I married Stiles too! Whaddyano! These were my first natural twins! I've just seen 2 births in that game at all and well, I was sooo lucky with that! Chad Avant (Evil/Flirty/Lucky/Snob/Computer Geek)is having an interesting life. After painstakingly putting the rest of his life on hold to climb the tiers of the medical profession, coming home most days stressed out and tired, then getting woken up at stupid hours to save the lives of other, less great sims, he's managed to become a World-Class surgeon, which lets him work less hours (still on call, though!). This hasn't really brought him happiness, though... While moving through town on an opprotunity, he caught the eye of his current girlfriend, Gwen Glover - a girl with big dreams and a pretty smile. (Brave/Good Sense of Humor/Artistic/Charismatic/Lucky) Gwen and Chad hit it off, and quickly established a relationship, which culminated with her moving in with him. Their small-ish house is just perfect for them, but Chad wants to get out of the Medical profession and spend more time with Gwen, which is good as she is growing cold to their lack of contact due to differing work hours. But can Chad get the couple's monetary affairs in order before the pressure of trying to juggle jobs, his relationship, and his own evil nature makes him crack completly? Nothing much because I'm spending too much time here reading threads! LOL! I think its time I went a played . . . Currently working on the guitar skill and the mastery of it. Heinrich and Ruby's relationship proceeded in an orderly manner. I no time where they engaged. Their wedding took place in the gazebo. As Heinrich was the one to send the invitation, and he pretty much knew nobody in town, the only guest was Ruby, who showed up wearing her wtf wedding dress. There was one other "guest", I first thought it was some random middle aged woman, but it was not. First, it was not random, but Ruby's cousin Susie, second it was not middle aged, but a teen. Here's a pic of Susie taken when Ruby was visiting her parents. And on a side note, I just love the fact they can visit other people. Ruby is flirty, good and a party animal as well as two other things I cant remember. She likes electronic music, pancakes and the colour yellow. She came equipped with a stereo, a romantic novel and a guitar, and she had a part time job in the spa. Heinrich finally figured out fishing, grapes seem to do the trick. He's been getting normal small fishes, 5-10 simoleans worth. The family also now has a goldfish named Samantha. His garden is doing quite well, now that I finally figured out the whole gardening thing. He finally was able to fulfill the "grow a great lettuce" want, the perfect lettuce plant is still undone. He got a challenge to grow and take two perfect products to some ugly lady who wants to cook something. Thankfully the lady has patience as growing a perfect plant is no piece of cake, at the moment, Heinrich only has one grape plant that is perfect, and if all goes well hopefully it's fruit will be perfect as well. So he only needs one more perfect plant. Most likely it will be the watermelon, as that's one step below perfect. Both kids still had some days left before turning from YA to adults, so I was not that bothered with them not wanting kids. I still of course emulated risky woohoo with a dice, one meaning try for baby, the rest is safe. But when they turned into adults, and days later nobody was still wanting kids, I was getting desperate. Risky woohoo was not being very risky even thou they woohooed almost every night, only once did I get try for baby, but that didn't get her pregnant. Thankfully, a few days later, both got the want to have their first kid, and after lots of doing inappropriate pregnant things, like running and cycling, Eliza was born in the hospital. Ruby is actually a fun sim to play, I once sent her and Heinrich out on town, she took a cab, he the bike, and midway her cab ran over Heinrich, I thought it was hilarious. Ruby is still working on her music, she has no big plans on being a rock-star, only for her own entertainment. She actually got the want to have the baby when she was playing for tips in the park, she got none that day, but she got 14 simoleans on another try. Her want was to have 25 simoleans in tips, so hopefully those 14 will be counted when ever she has the time to go back to the park. Heinrich's hobby apart from gardening and fishing is working out, when ever he has the time, he'll jog to the gym, and then pump some iron. He also jogs to the fishing places. They do have a pond in their farm that has fish, but there are not so many there. The family finally brought a car, that Ruby used to drive herself to the hospital, while Heinrich went back to sleep after the initial, omg the baby is coming. He did go there finally, barely in time. While ruby was pregnant, she got an opportunity to play music at the shcool, she rushed there, as the instructions said go as fast as you can. But she had no option to rock the place. I could see the option, but it was grayed out. Thinking it had something to do with being pregnant, I sent her to the school the day after the baby was born. But when I went to the car, it was not there. Sure they had been robbe, Ruby goes on calling the cops, who just fines her 500 simoleans for calling them invane. Later I found the car in her inventory, obviously she had put it there when she took the cab home back from the hospital. Ruby is now on maternity leave, and still can't rock the children at school. I hope the opportunity has taken that into consideration and won't disappear before Ruby is back being a useful tax paying sim. Heinrich has no friends and needs none. Ruby also has no real friends, only her family. She's very close with the now grown up Susie, has a good relationship with her dad and one of her brothers, but has no relationship with her mom or her other brother skip. I think the party system is way better than in sims 2. You can scedule the party to start at a given time, you can choose what type of party, and what should the guests wear + "and this is the best part" the guests bring you food. I'v so missed those chocolate boxes sims 1 used to bring when visiting, and now it's back maybe guests can bring other things, but for now, I'v only gotten food. Ruby has had two parties, one was her and Heinrich's birthday, as they turned into adults on the same day, and the second was a house party after the baby was born. In Riverview, Don Lothario was seeing a girl named Fatima. She was already married (or at least had a boyfriend). After about a day, he took her to his house and got her pregnant. Right after he found out she was pregnant, he dumped her. Don then found his next girlfriend, a lead guitarist named Heidi. He went steady with her and did a woohoo with her a few times. After about four sim days, Don invited over Fatima to see that she had given birth. Don ran off to his job as a police officer, leaving Fatima, her baby, and Heidi alone. When Don came home, everything went downhill. Heidi was mad that he had a son with another girl and didn't tell him. (:p) The next day when Don was at work, I *purposely* lowered his needs. He came out of the police station and dropped dead, to which in my mind, I make his girlfriend assume was because of heart failure or something. Heidi began to hang around the graveyard at night, mourning over her loss. When she was crying one night, a cute ghost named Jammer Latoll consoled her. Growing attatched to him as well as Don, she waits the graveyards at night, waiting for Don and/or Jammer to come out of their graves. Or, at least to get that call from the science lab to resurrect Don. I made Joe Chin from Ghosthunters and Ghosthunters International and have been playing him. He's evil, genius, lucky, virtuoso and loner. He takes his guitar into the bathroom and rocks out all the time. I knew it was great when his first wish was to see a ghost! Ghosthunter away! The sim I'm playing is called Trent Traveler. He's a hitchhiker who stops by Sunset Valley and camps out. He has a "lot" that has a campfire on it. He also owns a guitar which he carrys around with him (music career). He sleeps on park benches, showers and pees at the public swimming pool and eats at resturants. Pretty much he's homeless but in a good way. He's brave, athletic, loves the outdoors, virtuoso, and friendly. He recently met Jane Summers, and they got married. Now they are looking to buy a house and have a kid. Adult Downloads Can Be Found On MTS2's Adult Site!! !